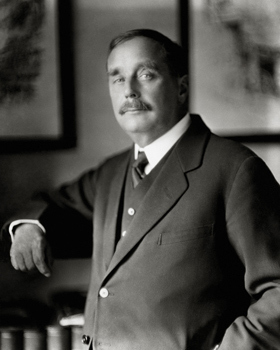 Herbert George Wells (21 September 1866  13 August 1946) was a British Science Fiction writer who, along with Jules Verne, defined the genre during the late 19th and early 20th century, and spawned many tropes, including the Time Machine and the Alien Invasion. His most famous works have been adapted into film multiple times. The Time Machine, The Island of Doctor Moreau, The Invisible Man and The War of the Worlds are probably the best-known. Many of his novels were written in the first person, narrated by a typically unnamed character. In many adaptations, The Time Machine's unnamed time-traveler is H.G. Wells himself, which has led to other works using the real-life Wells as a time-traveling character. In his later life, he turned more toward what he thought society should be like; fictional Utopias and Dystopias and nonfiction books on socialist thought alike. Though Wells thought of these works as more important, it's his early stuff that's thought of as classic, at least in part because it is generally better written. G. K. Chesterton compared him to Esau, saying that just as the latter had sold his birthright for a mess of pottage, so Wells traded his talent for a pot of message (although he was a fine one to talk). His life had quite the Bittersweet Ending, as he was very worried about the rise of Nazism and warned that it might just lead to an apocalypse like the ones he'd written about, which can make it a relief that he lived long enough to see the end of World War II...until you realize this also means one of the last major scientific achievements he witnessed was the atomic bomb. Often portrayed, in fiction, in Beethoven Was an Alien Spy-style situations, involving either Time Travel or Aliens. If they do involve time travel, he usually ends up in the modern world and becomes very depressed over the fact that modern society is just as far away from his proposed utopias as his own time was. Said fictional portrayals often leave out the fact that his voice resembled an English-accented version of Tex Avery's Droopy (as can be heard in a radio interview he did with Orson Welles (no relation)). It's been said that he invented almost every basic modern science fiction device except for alternate universes. His stories, along with those of Jules Verne, are also a major influence on Steam Punk. Along with Jules Verne and Hugo Gernsback, Wells is often considered "The Father of Science Fiction". In many ways, the works of Jules Verne and H.G. Wells are polar opposites. Verne paid particular attention to technological realism, making him perhaps the world's first hard SF author; but he paid little heed to the social ramifications of such technology, projecting 19th century Europe into the future indefinitely. Wells, on the other hand, cared little if his proposed inventions violated every known law of science, but he was keenly interested in how society would change and pulled no punches when it came to civilization's impermanence. He is also considered a founding father of commercial wargames. He and some of his adult friends started playing with toy soldiers, and starting codifying rules. He felt it was better than fighting a real war, because "Tin soldiers don't leave behind tin widows and tin orphans." Wells eventually published Little Wars which contains the story of the creation of the game, the many balance and Game-Breaker issues they ran into, and a suggested set of large scale miniature rules. Little Wars is still required reading for prospective game designers. Another over-looked aspect of his life is that in his 'middle period' from around 1900-1920 he authored fiction that mostly lacked any science-fiction elements, such as Anne Veronica and The History of Mr. Polly. As one of the founders of science fiction, he often shows up in modern sci-fi works as a Historical-Domain Character. Notably he was played by Malcolm McDowell in the film Time After Time and was Gender Flipped for the SyFy series Warehouse 13. Attack of the Killer Whatever: "The Empire of the Ants" has an army of intelligent, unstoppable (albeit normal-sized) ants that are slowly but relentlessly conquering the Amazon region of South America; the narrator ends with a prediction that they'll reach Europe within a few decades. Also packs of predatory squid-creatures in "The Sea Raiders" and migrating spiders in, well, "The Valley of the Spiders". Adaptation Decay: Films made from his work often suffer from this, two particularly flagrant examples by Bert I. Gordon are The Empire of the Ants and The Food of the Gods. Adaptation Expansion: The 1936 film version of The Man Who Could Work Miracles, whose script Wells contributed to, expands on the adventures of the eponymous George McWhirter Fotheringay (and gives an explicit source to his sudden powers). The Amazon: The setting for "The Empire of the Ants." The Bad Guy Wins: As noted above, "The Empire of the Ants" ends with a grim prediction this will be the ultimate outcome. Bug War: "The Empire of the Ants", though the ants are far from a mindless swarm, which is what makes them so lethally dangerous. Booby Trap: The poisonous thorns attached to "The Treasure in the Forest". Cruel and Unusual Death: "The Cone" has a man being thrown on top of a blast furnace. Drunk with Power: Fotheringay gets more and more extravagant with his wishes. It ends very badly. The End of the World as We Know It: The passing of "The Star" through the Solar System inflicts this on humanity, stopping just short of an Earth-Shattering Kaboom. As implied by the title, "A Dream of Armageddon" has a character relating his vivid vision of a future world being consumed by global war. Everything's Squishier with Cephalopods: The eponymous menace in "The Sea Raiders" is swarm of a previously-unknown species of squid which starts attacking humans along England's coast. Exact Words: In "The Truth about Pyecraft" the fat Pyecraft drinks an Indian potion which promotes "Loss of Weight". (The narrator describes it as "committing the sin of euphemism".) Instead of making him thinner the potion decreases his mass, making his body behave like a balloon. Since the lift of a man-sized balloon cannot be as strong as described, even for a very fat man, his gravitational mass may have become negative. Grail in the Garbage: "The Crystal Egg" turns up in a obscure second-hand store before being lost again, at least as far as the narrator and reader are concerned. He Also Did: Most famous for his science fiction, Wells also wrote numerous novels and short stories with no fantastical elements whatsoever, along with Little Wars, a treatise on war gaming. The Time Machine: A story about travelling to The Future. The Invisible Man: A story about a man who has become completely invisible. Imported Alien Phlebotinum: The narrator speculates that "The Crystal Egg" is an example of this, sent from Mars to allow that planet's inhabitants to (evidently idly) view life on Earth. Karmic Death: The protagonists in "The Treasure in the Forest". Literal Genie: In "The Man Who Could Work Miracles" has numerous examples of this, culminating in Fotheringay ordering the sun to not set. The wish-granting force, whatever it is, accomplishes this by abruptly halting the Earth's rotation. Just the Earth itself, not anything currently on the Earth's surface. Look on My Works, Ye Mighty, and Despair! : a recurring theme in Wells's work is that while technology represents some of the the best aspects of humanity, it can just as easily be our undoing if used unwisely. The Missionary: One appears at the end of "Jimmy Goggles the God". No Pronunciation Guide: The main character of The Man Who Could Work Miracles is named Fotheringay, which is one of those traditional English names that are infamously pronounced nothing close to how they are spelt: in this case, Funginote by which we mean the original pronunciation in Classical Latin, NOT any of the later Anglicized ones. Our Ghosts Are Different: "The Inexperienced Ghost"
Out, Damned Spot! : In "The Moth", a probably illusionary moth haunts the protagonist following the rather pitiful death of his hated scientific rival, finally landing him in an insane asylum. Reality Warping Is Not a Toy: Yeah. See above. Reset Button: After the Literal Genie incident above, Fotheringay very carefully makes one last wish that results in this. Sacrificial Planet: Neptune gets destroyed in "The Star". And at the very end, Earth essentially becomes this, at least as far as observing Martian astronomers are concerned. Spiritual Successor: "The Shape of Things to Come" to "The War in the Air", bordering on a Stealth Sequel. The first part of the former is essentially a Broad Strokes reworking of the final part of the latter, accounting for Science, Technology, and Society Marching On. Super Speed: As noted, "The New Accelerator" depicts the narrator helping a scientist test the latter's new formula that induces this ability in humans. Tank Goodness: The Ur-Example in modern fiction can be found in Wells's short story "The Land Ironclads", which forsaw the tank's paradigm-shifting impact on warfare. Among the predictions is the potential for (newly invented at the time) continuous track systems to allow massive armed and armored vehicles to unstoppably plow over men and defenses alike. Treasure Map: One appears in "The Treasure in the Forest". Trope Namer: He coined the first incarnation of what would later become the phrase "The War to End All Wars", in a series of newspaper articles he wrote in August 1914 that were collected into the brochure The War That Will End War. 20 Minutes into the Future: The setting for "The War in the Air" at the time it was written. Weight Loss Horror: In "The Truth About Pyecraft", a very fat man takes a potion to lose weight. And he does  but he doesn't actually become thinner. He just weighs less until he's floating up into the air like a large balloon.